Milan 2013: a compact furniture production line designed by Design Academy Eindhoven alumni Thomas Vailly, Itay Ohaly and Christian Fiebig has won this year's Frame Moooi Award. The creators of the Impulsive Furnishing Unit were presented with the interior design award this evening in a ceremony at the Salone del Mobile in Milan. 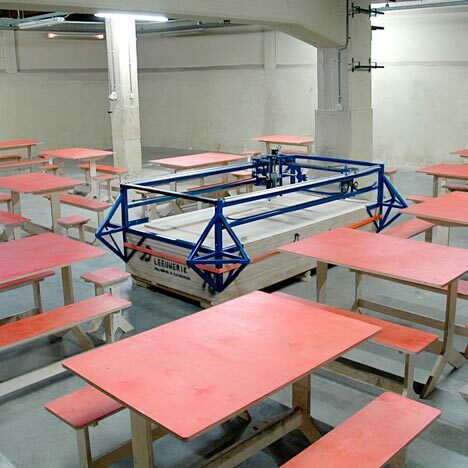 Thomas Vailly, Itay Ohaly and Christian Fiebig's design compresses a whole furniture factory to the size of a standardised plywood pallet so that it can be shipped and used anywhere. "By adjusting the CNC machine to the thickness of each sheet, it will only cut one sheet at a time," explain the designers. "As soon as the machine is finished with cutting the top sheet it will cut two holes as handles on one of the length sides of the board. "This side of the machine can then be opened and the cut board can be pulled out. The CNC machine will smoothly drop on the next sheet to cut. If one pallet of wood is almost finished it simply has to be stacked on the next pallet, and the machine continues to cut sheet by sheet." The machine was used to create furniture for the C-Fabriek exhibition in the Netherlands last year, where visitors were invited to pitch in and make furniture, lighting, clothes, shoes and more on experimental production lines. The Frame Moooi Award is presented annually to furniture or lighting custom-designed for a specific public or commercial interior and the winner receives €25,000. The finalists were anonymously selected by Jana Scholze, curator of contemporary furniture and product design at the V&A museum in London. Vailly is also showing a compact fashion production line designed with Laura Lynn Jansen, called Inner Fashion, and another one-man furniture factory, Stool Unit, in Milan this week at Cascina Cuccagna, Via Cuccagna 2, on the invitation of Eindhoven-based StudioKlawer. We've previously featured a few other designs by Ohaly, including benches that have been torn or smashed into individual chairs and jewellery carved from layers of coloured paint applied to a wooden table – see all design by Itay Ohaly.